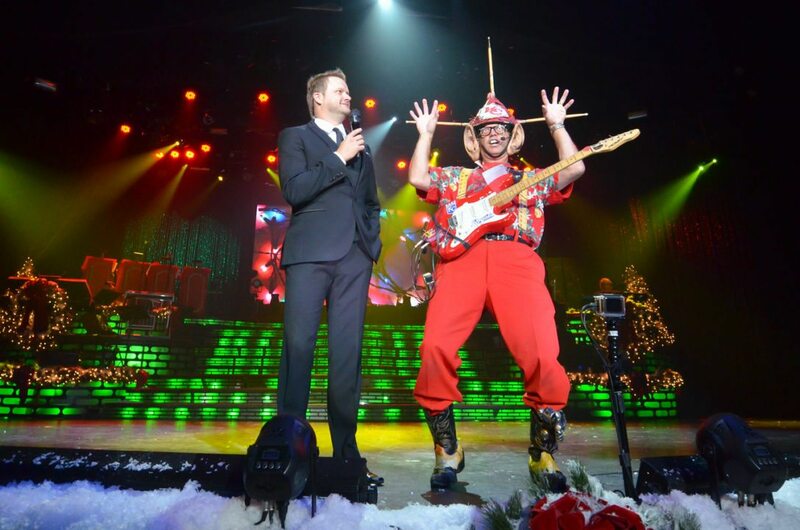 Celebrate the spirit of the season at one of Myrtle Beach’s spectacular Christmas shows! Get the family together for a special night out of incredible entertainment at one of these local shows! Carolina Opry’s famous Christmas special, adorned with the name “Christmas Show of the South”, is back and better than ever in its 33rd season of holiday performances! 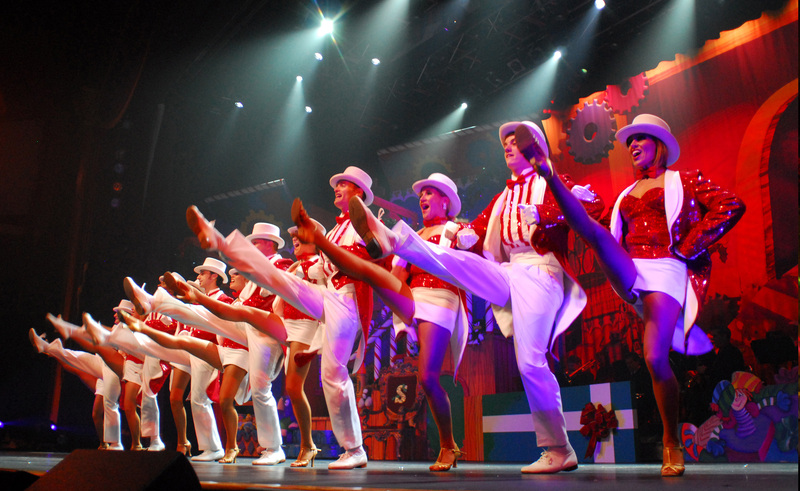 During the show, you and your family will experience a grand performance with production flair all while keeping your treasured Christmas traditions alive! A Southern tradition perfect for the whole family to enjoy! Alabama Theatre Christmas Show blends the tried and true favorites you know by heart with contemporary music and entertainment! Prepare to be amazed by spectacular scenery and costumes throughout the festive show! If you’re looking for a show that will take you to new heights, you have to go see the acrobatic pirates at Pirates Voyage “Spirit of Christmas”! A spectacular show perfect for the whole family filled with original music that will have you dancing, classic Christmas carols, and live animals performing tricks! The best part is, a yummy and filling dinner is served during the show! This is the spot to be to get into the holiday spirit with all of your favorite musical icons! 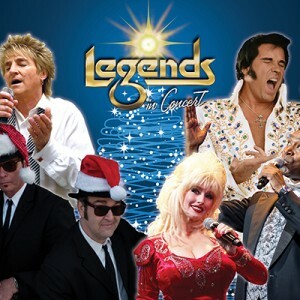 Legends in Concert Christmas Special features the iconic songs and performances from Elvis Presley, Frank Sinatra, and Aretha Franklin! Legends is located right next to Broadway at the Beach which makes it easy to grab a tasty dinner before the show! When you stay with Marina Inn at Grande Dunes this holiday season, you’re only minutes away from all of Myrtle Beach’s top attractions! Take advantage of our special holiday packages and book today! Wishing you and your family a Happy Holidays! Ready to get into the holiday spirit? Check out these festive holiday events happening all along the Grand Strand! When you stay with us at Marina Inn at Grande Dunes you’re only minutes away from all the most exciting attractions in Myrtle Beach! This Saturday, December 1st head to Broadway at the Beach for a full day of Christmas activities and entertainment! Begin the day at 11 am with a Christmas parade through Broadway at the Beach! Grab some lunch at one of the various restaurants before taking the kids to participate in festive activities until the tree lighting ceremony at 6 pm! Walk around the natural wonderland of lights at Brookgreen Gardens! Night of a Thousand Candles is one of the most beautiful attractions happening along the Grand Strand during the month of December. Perfect for a romantic date night or for bringing the whole family to enjoy the sights! Visit the spot known as a local’s favorite! At the MarshWalk in Murrells Inlet, you can stroll along the water enjoying the twinkling lights perfect for getting into the holiday spirit! There will also be live entertainment playing your favorite Christmas music that will sync up with the lights along the MarshWalk! Head to Murrells Inlet for fresh seafood dinner then stay after dark for the festive light shows! Head to La Belle Amie Wine Vineyard for relaxing and peaceful holiday events. Experience local wine selection and music around the relaxing fire! La Belle Amie is the perfect spot to get away from the crowds and hustle of people along the beach. Each event is $5 to enter! Take a drive through Myrtle Beach’s winter wonderland light show! Open nightly, this is a perfect spot to take the kids to get into the holiday spirit this holiday season! With over 2 million lights displayed along the 1.5-mile drive, you surely won’t want to miss this! After the light show, park your car and head to Santa’s Village where you can enjoy hot chocolate, go tubing down an inflatable slide and meet Santa Claus himself! When you stay with Marina Inn at Grande Dunes, you can live in luxury while close to all the festive attractions in Myrtle Beach! Book with us to take advantage of our current holiday special packages! When in Myrtle Beach for your summer vacation, you want to experience all the sights, tastes, and yes, even the sounds! There’s nothing quite like enjoying a beautiful waterfront view while listening to local musicians set the mood with their songs. When you’ve booked your stay at Marina Inn at Grande Dunes, make sure to check out these five hot spots located within a short drive from Marina Inn, that are sure to make you swoon! 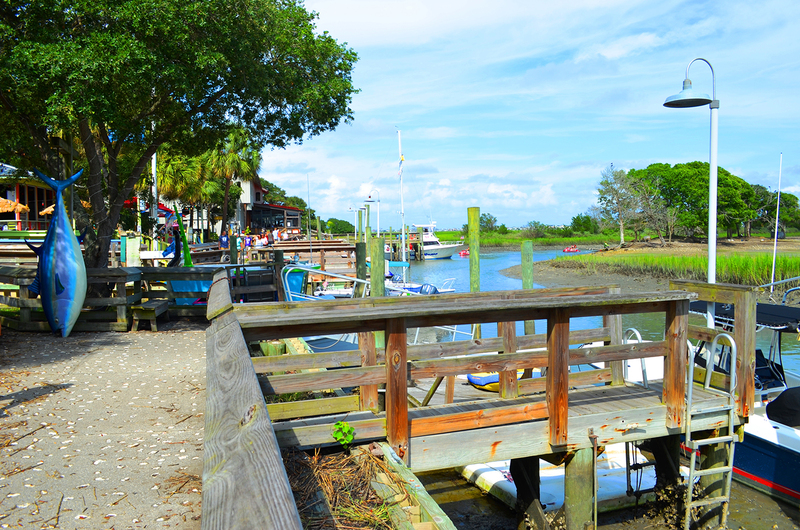 The MarshWalk in Murrells Inlet is a Myrtle Beach locals’ favorite spot to get away from the hustle and bustle of the beach to relax and unwind. With multiple bars and restaurants, the MarshWalk is filled with a variety of atmospheres – each featuring their own live music each night! Grab dinner and a drink from one spot then stroll along to the next bar to check out the other musicians performing. 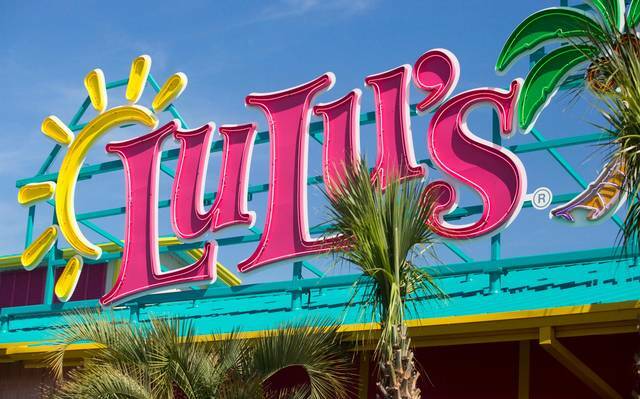 One of the newest live music spots in Myrtle Beach, LuLu’s prides itself on having a family friendly atmosphere with great food and even better views of the water. 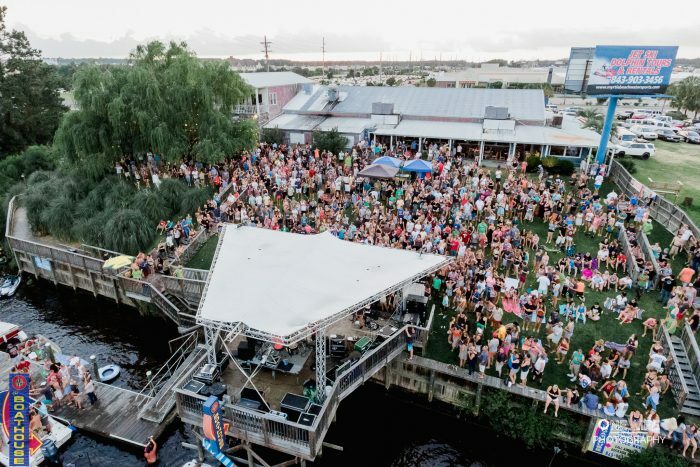 Located at Barefoot Landing, a restaurant that’s a product of Jimmy Buffett’s little sister, Lulu Buffett, has got to have some amazing musical performers coming through the doors. After dinner, you can stroll along the boardwalk at Barefoot Landing and take in the beautiful views! 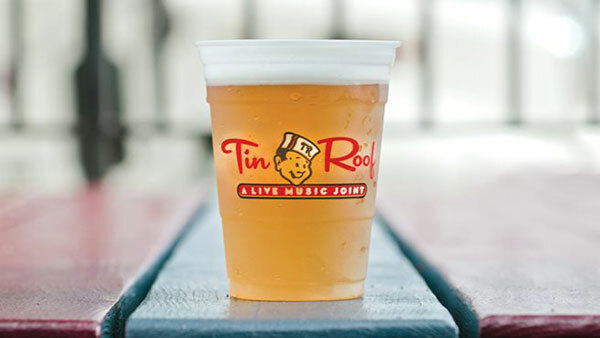 A brand new spot located in downtown Myrtle Beach, Tin Roof brings all of your favorites together in one place. With live music every night and a unique drink menu, it’s always a new experience at this bar! The casual atmosphere and local community feel of Tin Roof, allows visitors to mingle with the musicians. This is the perfect spot for a fun night out in downtown! 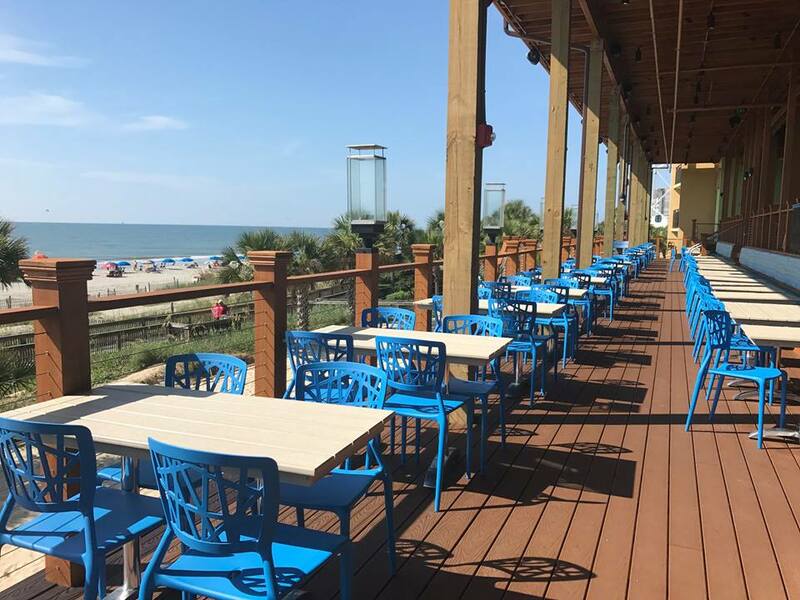 Located next to the Myrtle Beach SkyWheel with perfect oceanfront views, Riptydz is a casual spot the whole family will love with a spectacular view of the water! Their giant menu that’s as big as their fishbowl cocktails, features a little bit of everything. Plus they have live music in the restaurant as well as a DJ on the rooftop bar, where you can dance the night away! 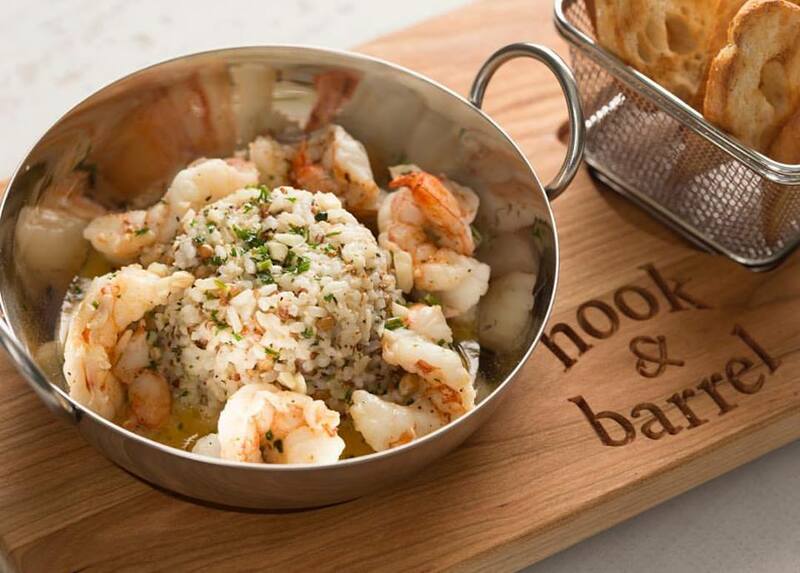 The Boathouse is located right on the Intracoastal Waterway and is a hidden gem, tucked away from the flashy tourist attractions. On Sundays in the summertime, The Boathouse features music from local to mainstream artists for a special Sunday Funday! Whether you enjoy it on foot or by boat, with a view of the waterway and a great band – you’ll sure to have the ideal summer night here! Take advantage of Marina Inn’s Ultimate Summer Experience Sale from now until August 31, 2018. You can save up to 35% off your suite for a vacation that’s fun for the whole family. And by choosing to stay at Marina Inn at Grande Dunes for your summer getaway, you’re choosing to be minutes away from all the best live music venues in Myrtle Beach. Click here to take advantage of our sizzling summer sale going on now! 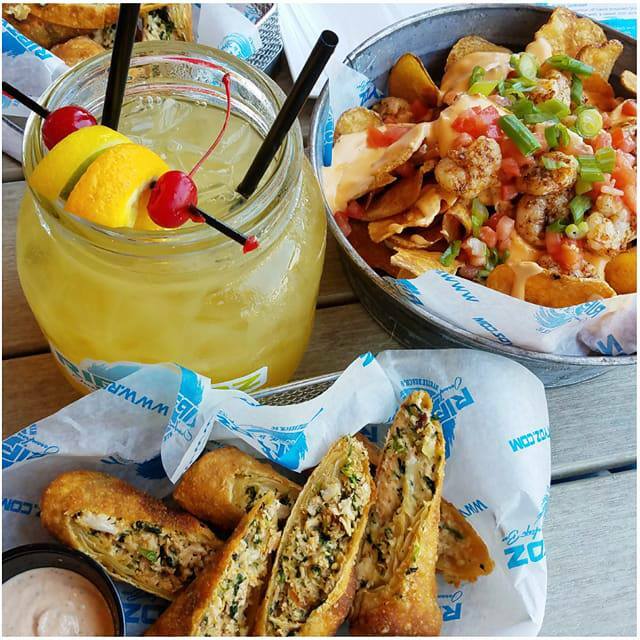 Whether you’re a first time visitor or an honorary local, you won’t want to miss out on the best new spots in Myrtle Beach. No two summers spent in Myrtle Beach are exactly the same! A family restaurant franchise owned by NASCAR driver Dale Earnhardt Jr., Whisky River will have a sports bar theme. The new restaurant will also feature an apparel shop and a casual menu of hamburgers and hot dogs. 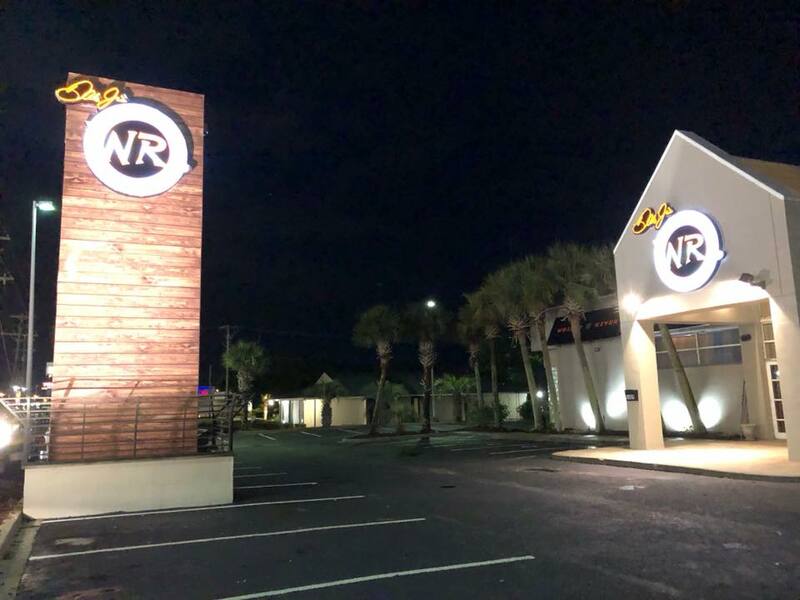 Whisky River will be located in North Myrtle Beach and will include a second level with a stage for live music performances! This is sure to become a new favorite on the Grand Strand. A new addition to downtown Myrtle Beach, Riptydz is a three-level restaurant and bar that overlooks the ocean. 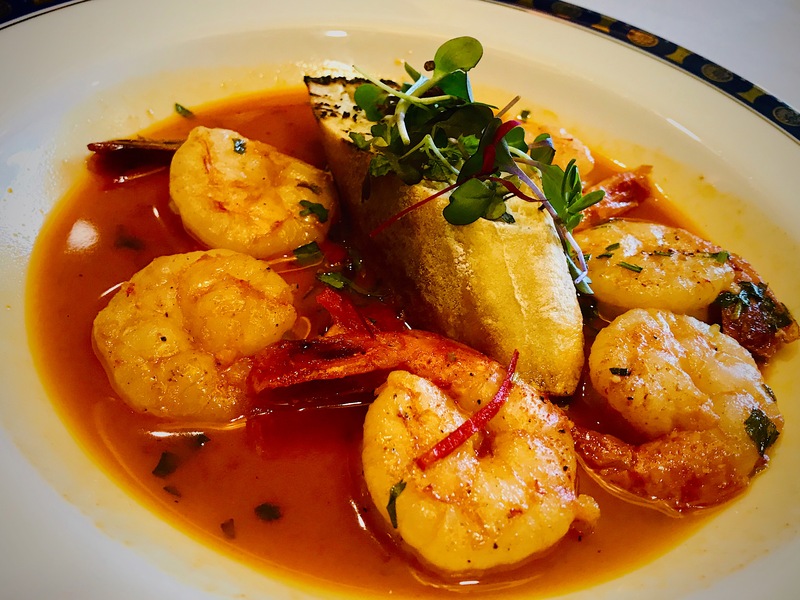 The menu is unique; offering customizable mac and cheese and fresh seafood, but also features traditional dishes that everyone will love! The newest restaurant at Barefoot Landing, LuLu’s, is owned by singer Jimmy Buffet’s younger sister Lucy. 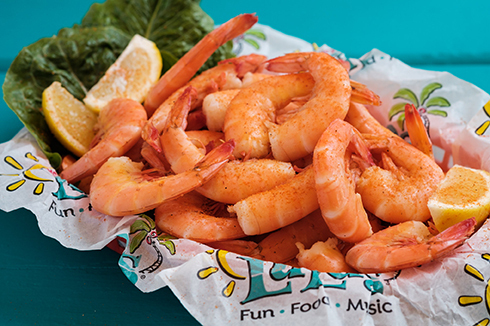 Located in Barefoot Landing along the waterway, LuLu’s is the perfect spot for enjoying yummy food and live music. 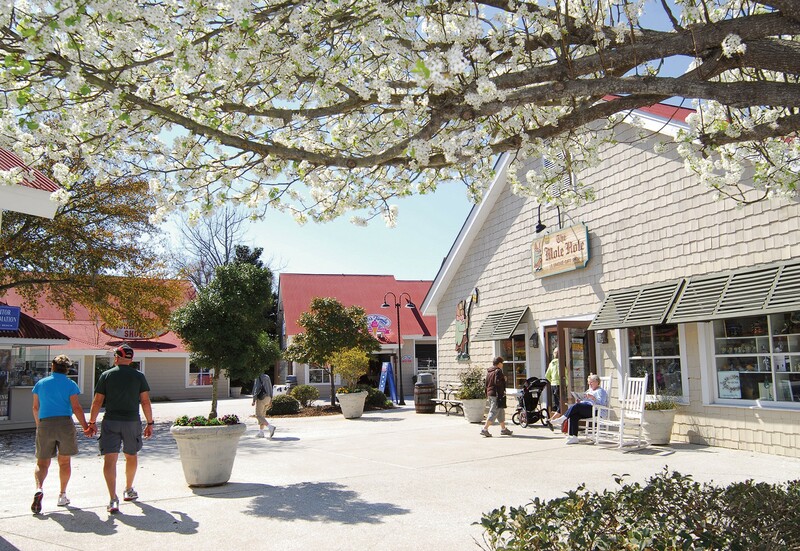 Spend the evening at LuLu’s after shopping in Barefoot Landing or playing on the beach! Heidi’s Corner is a local restaurant group in Myrtle Beach with delectable dishes and desserts that will satisfy any craving you have. Croissants and Hook & Barrell are loved by both locals and visitors of the Grand Strand because of their homey feel and crafty menu items. They are located in a shared building on 82nd ave in Myrtle Beach. If you’re looking for thrilling fun along the Grand Strand look no further than The Track! 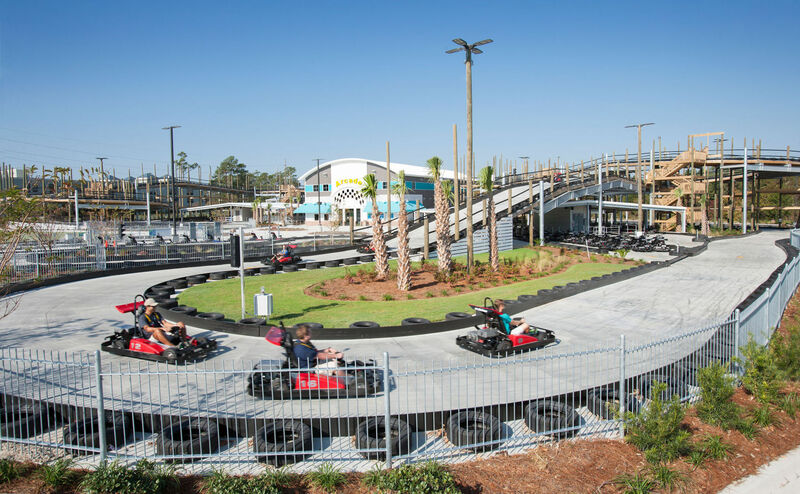 This elevated go-kart race track is unique on The Grand Strand and just the right place for adrenaline junkies. The Track also offers kid rides, a carousel, and an arcade! Top Golf has it all! Golf lessons, kid zones, and a full restaurant and bar that will keep you entertained for hours. 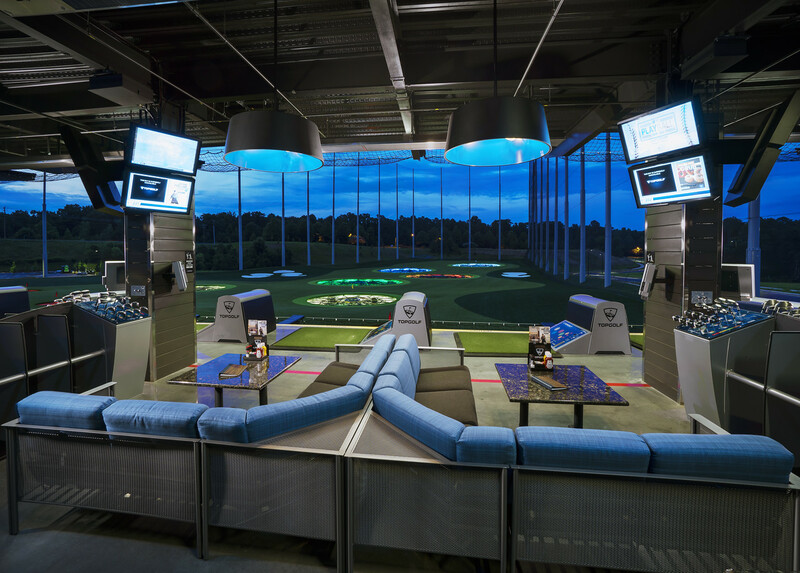 At Top Golf, you can choose from a variety of different games and play golf like never before. The newest addition to the Grand Strand still isn’t open yet! Top Golf in Myrtle Beach is coming soon to our area next to Broadway at the Beach. So we’ll just keep practicing our backswing in the meantime. A hot day spent on a floating jungle gym jumping into the water? JumpJam is the best way to beat the heat and try something new with your family in Myrtle Beach. 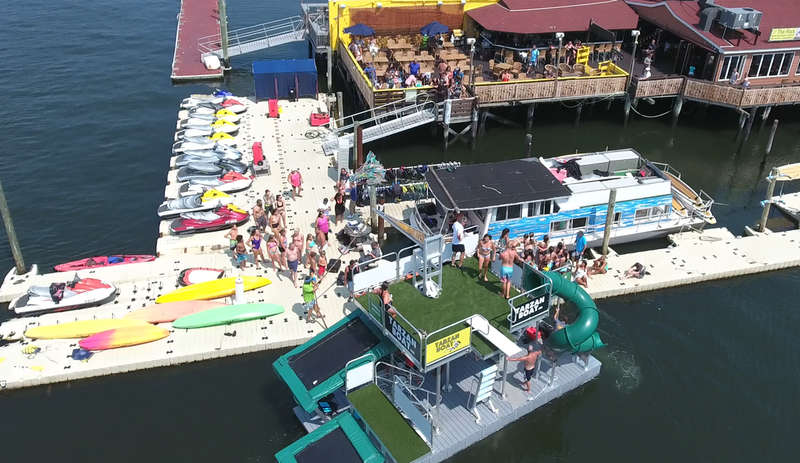 JumpJam offers a variety of jungle gyms that float on the water with special obstacles including a trampoline to launch into the water. If you’re looking for a little monkeying around this summer, JumpJam is for you! 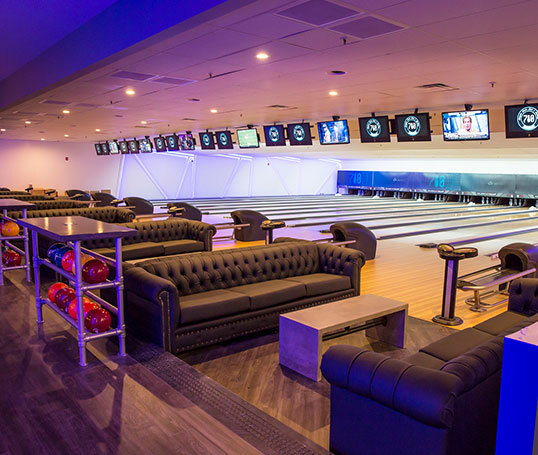 Located in Market Common, this is more than just your average bowling alley. 810 Billiards & Bowling was designed with family and fun in mind. Bowling is the main attraction, but 810 also has pool tables, foosball, darts, board games, and corn hole! It’s impossible to run out of things to do at 810 Billiards & Bowling! When you stay at Marina Inn Grande Dunes, you’ll be a short drive away from all of the summer fun! 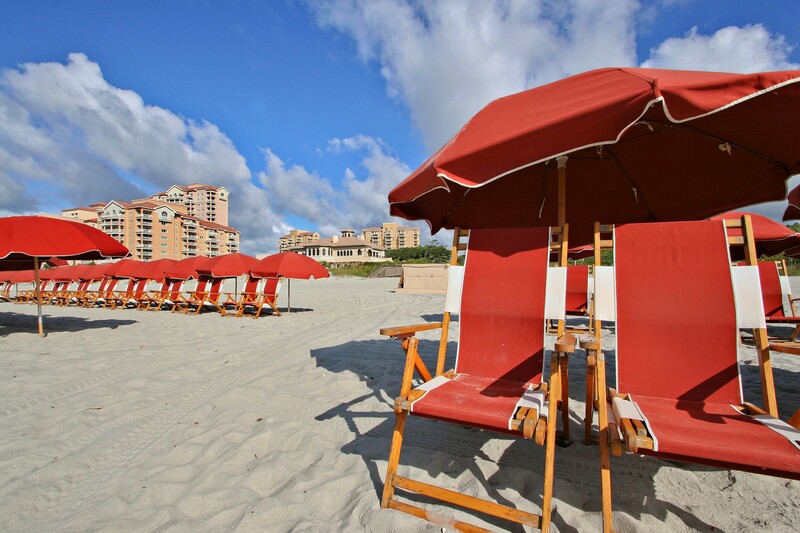 You can also save big when you book your accommodations under our summer sales package. Plus, kids stay and eat free at Marina Inn Grande Dunes all summer long! If you’re looking for an exciting family vacation that won’t break the bank, make plans to head to Myrtle Beach and stay at Marina Inn! Spring Into Fun This Spring Break in Myrtle Beach! It’s time to break out the sunscreen and bathing suits here in Myrtle Beach! With winter being nothing more than a distant memory, we are embracing the sunshine and warmth here in the south. While you count down the days until spring break, finish up some last minute planning and add these attractions to your list of must-sees while you’re here. Spring won’t be the only thing in full bloom this year. Brookgreen Gardens is the cultural hotspot of South Carolina’s coastal community and is blooming with beautiful flowers year-round. Enjoy the southern sunshine as you explore the breathtaking gardens and admire the stunning sculptures or take in the sights of the lowcountry zoo. Brookgreen Gardens is open daily from 9:30 a.m. to 5:00 p.m. You may purchase tickets upon arrival; seniors (aged 65 and up) can purchase tickets for $14, adults (aged 13-64) can get in for $16, children (aged 4-12) can get in for $8, and all children under 4 get in for free. 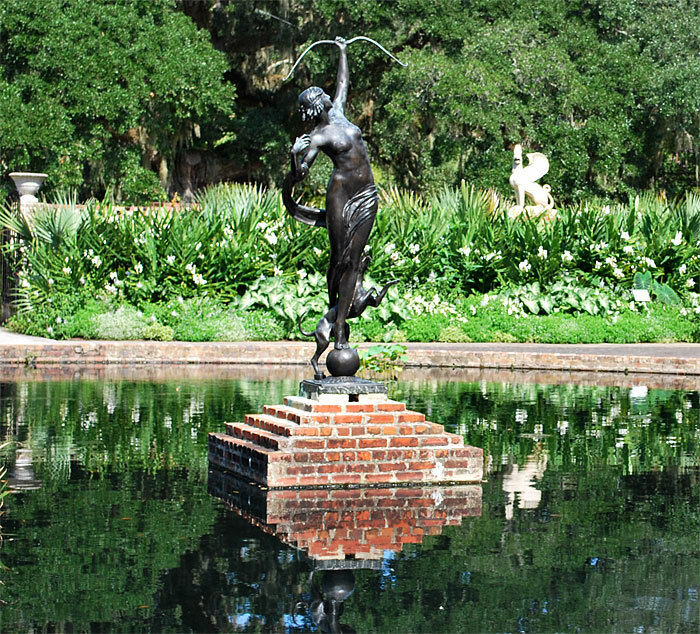 On top of beautiful horticulture, Brookgreen Gardens boasts a collection of 2,000 works of art ranging from sculptures, paintings, etchings, and more from internationally renowned artists. Artwork is incorporated into the gardens as well as displayed indoors in the Rainey Sculpture Pavilion. After you’ve had the chance to immerse yourself in the art and you’re finally able to tear yourself away from the gardens, head on over to the lowcountry zoo. In the lowcountry zoo, you have the chance to see animals native to the area that are kept in areas maintained as close as possible to their natural habitats. Animal lovers of all ages will love getting to see wild animals such as alligators, bald eagles, grey and red foxes, white-tailed deer, river otters, and more! For those of you are animal lovers, you can get up close and personal every day at 2:30 p.m. with an interactive session hosted by an interpreter. This experience is included in your garden admission and takes place in the Campbell Center Program Shed. Nothing beats driving with the top down in the spring. For those of you without a convertible, satisfy your need for speed and sunshine at The Track! Whether you’ve got a family of youngsters, a couple teenagers, or mixture of the two, your entire family will find hours of entertainment here. Kids will love the Carousel and Baja Buggies rides on top of the unlimited fun the arcade and race track offers. The gamer in the family will feel right at home in The Track’s arcade, which features over 50 games. While you’re racking up points, pick out what prize you’ll be bringing back home with you, options vary from candy, toys, games, to gadgets. Satisfy your feelings of nostalgia with classics like skee-ball, Down the Clock, and dueling basketball goals. The younger generation will love taking a crack at Fruit Ninja, Deep Sea Treasure, Fishbowl Frenzy and more! When you’ve finally racked up enough tickets in the arcade, buckle up and head to the finish line! The Track offers two different race tracks, plus two kiddie tracks for the little ones! The Wild Woody is The Track’s signature elevated, multi-level track. You can race for first on your own or double up while you navigate through three levels for the win! The Mighty Myrtle, named after the beautiful Myrtle Beach, is a curvy three-level track that also allows you to take it on solo or with a teammate. 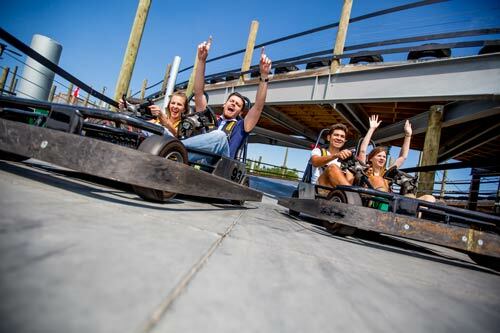 You can test out your driving skills in the electric carts while you loop around this fast-paced track. They might be too young for their driver’s licenses, but let the kids get behind the wheel and show us what they’ve got on the Rookie and Kiddie Tracks. The Rookie Track is ideal for kids between 4’0 and 4’8’’ tall. Let your little one burn rubber while they zoom around the track and leave their competition in the dust. Let your little speed demon test out their lead foot on the Kiddie Trail, which is perfect for kids between 3’6’’ and 4’0 tall. Take a walk on the wild side at Go Ape! While you’re vacationing here in Myrtle Beach, you have to experience an outdoor experience unlike any other. Live your life to the fullest while you take a guided 2-3 hour adventure through the forest canopy while you navigating dangling obstacles and cruise along the ziplines. You can test your skills on either the Treetop Adventure course or the Treetop Junior course. 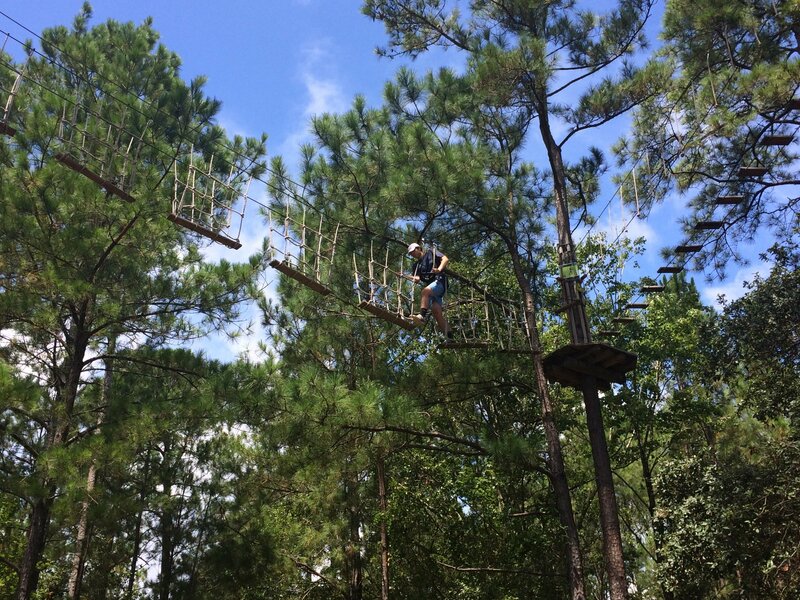 For those ages 10 and above, take on the high-rope courses of the Treetop Adventure course while you navigate obstacles all while taking in the stunning view. Those of you who are ages 10-15 can hit the ropes for $35 while those 16 and above can join you on the course for $58. All ages can enjoy the Treetop Junior course, which is an action-packed 1 hour introduction to high-rope activities meant to encourage problem-solving and build confidence! 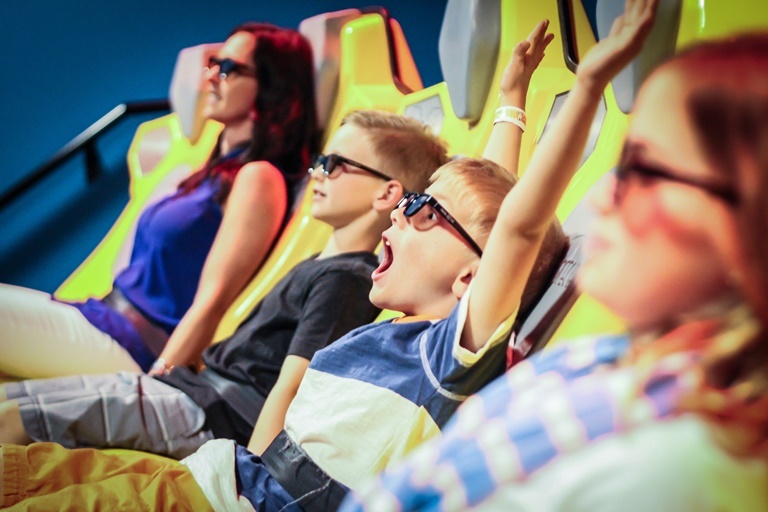 No matter your age, you can take part in this fun-filled course for $28! Spend a day on the water while you give cable wakeboarding a try! At Shark Wake Park, take watersports to a whole new level with this variation of regular wakeboarding, without the boat. Whether you’re an expert or a beginner, Shark Wake Park will give you a day on the water you’ll never forget. They have a 5-tower full size cable plus a 2-tower cable system that’ll help give you the ride of your life. No need to worry about gear, Shark Wake Park can provide you whatever you need. For $68, you can enjoy a full day of cable wakeboarding with gear included. For two hours, it would be $48 and for four hours it would be $58. 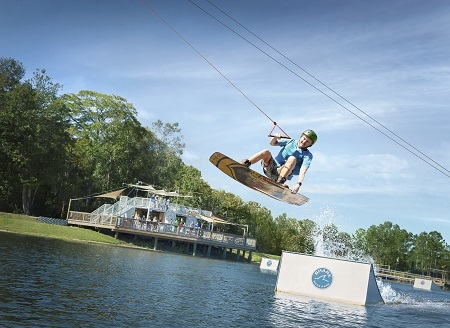 If you’re wanting something a little tame than cable wakeboarding, head over to their Aqua Park. Shark Wake’s Aqua Park is an inflatable, floating aqua park that covers over an acre of water! On April 3rd, make sure to bring the kiddies over to Shark Wake Park for Kids Day! Kids aged 15 and under can ride all day with beginner gear for only $34. Carry over the family fun into dinner time with all of the family and kid friendly dining options in Myrtle Beach. Head on over to Ultimate California Pizza GameZone for an evening filled with pizza, wings, and arcade games! While you wait for your pizza to come out, see how many points you can rack up playing skee-ball or bowling! Even though the pizza is the main attraction, don’t forget to load up on wings so you can finally settle the debate on which is betters: flats or drums. 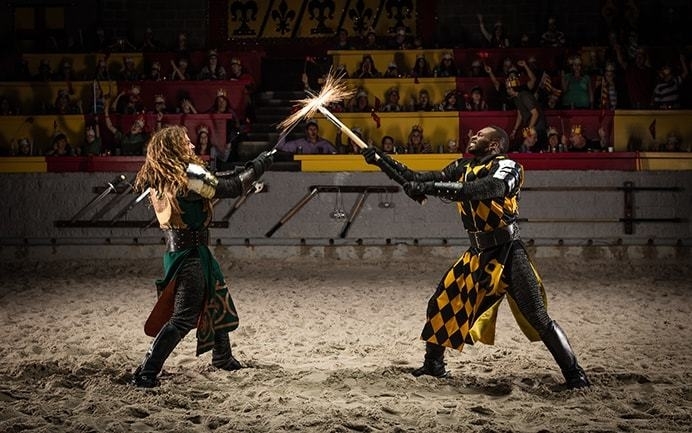 Treat your family to dinner and a show at Medieval Times. Take a step back to the Middle Ages while you dine on a four course meal. Throughout the evening, you can enjoy valiant shows of falconry, horsemanship, and sword fighting! Cheer on your favorite knight to victory while you make memories with your family that’ll last a lifetime. If knights aren’t your thing, shiver your timbers and head on over to Pirates Voyage. Dine on a tasty five-course meal while pirates set sea on authentic-looking pirate ships. 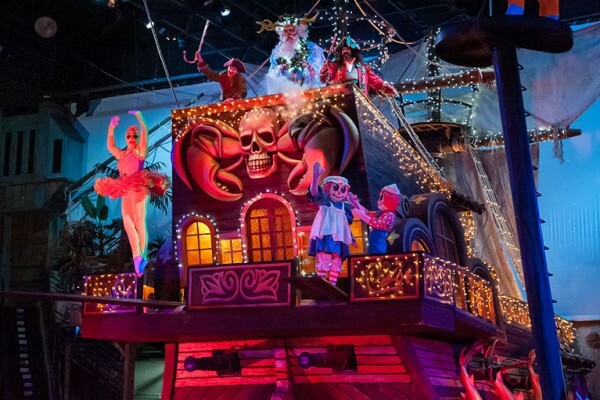 Your kids will love when the pirates interact with the crowd as they swing through on ropes. If you’re looking for the hidden treasure of dinner shows, Pirates Voyage is it. Make this spring break one you’ll never forget when you vacation in Myrtle Beach. And when you stay at Marina Inn, you’re only minutes away from non-stop fun. Book Your Myrtle Beach Valentine’s Day Package! Valentine’s Day is right around the corner and love is in the air along the Grand Strand! Before stocking up on heart shaped boxes of chocolate or picking out just the right card, why not switch things up this year and plan an enchanting getaway to Myrtle Beach? From waking up to a relaxing view of the waterway to the romantic candlelit dinner at WaterScapes Restaurant, we have plenty of amenities at Marina Inn at Grande Dunes to make your Valentine’s Day trip memorable! Package includes accommodations in a luxurious grande guest room for one night and a (5) course dinner for two and the best part about it is that this package has flexible availability. You can book this package for one night at the package rate and extend for more days at the best available rate anytime from February 9 – 17, 2018. Upgrade to one of our suites at an additional charge. When you stay the Marina Inn and book with our Valentine’s Day Package, you’re guaranteed to enjoy an intimate mini-vacation with your sweetheart. During your stay, you will have the to opportunity to enjoy luxurious accomodations for two and wake up to outstanding views while siping coffee as you watch the boats sail by on your private balcony. Choose from a variety of accommodations for two from the Grande King Guest Room, Studio King, Mediterranean Club Suite or the romantic Studio Deluxe. Book our in-room spa service “Couples Massage” so you can both be pampered by our talented massage therapists to ease your tension into tranquility. Book a 60 or a 90 minute massage. Package Includes 5-Course Dinner at WaterScapes! Once you’re done getting pampered, our Valentine’s Packages includes a decadent five-course dinner at WaterScapes, our on premise, award winning restaurant. 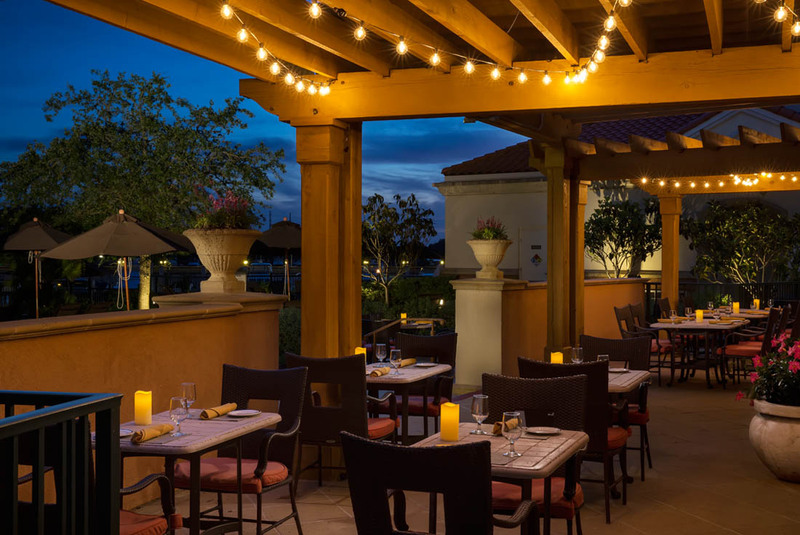 The romantic ambiance of WaterScapes paired with their fresh, localy sourced cuisine is the perfect way to wind down your evening and enjoy the company of your sweetheart. Choose from the tasty New York Strip Steak or Chilean Sea Bass. And we offer a variety of wines to select from that pair perfectly with each of the courses. 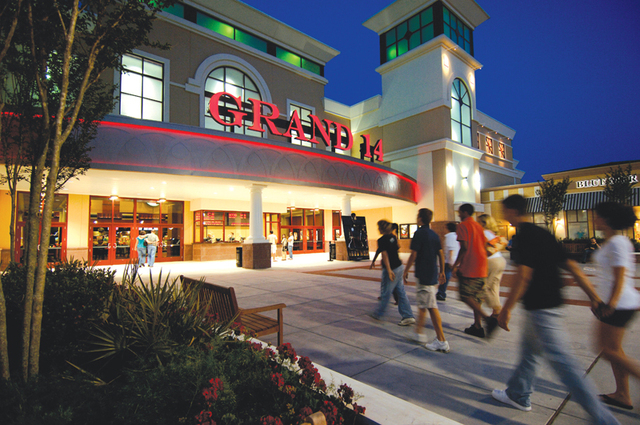 There are plenty of activities around the Grand Strand where you can soak up the quality time with your loved one. If you’re looking for a more relaxed and wine-filled way celebrate with your sweetheart, visit a couple of area winerys that specialize in muscadine wine from the native muscadine grape. 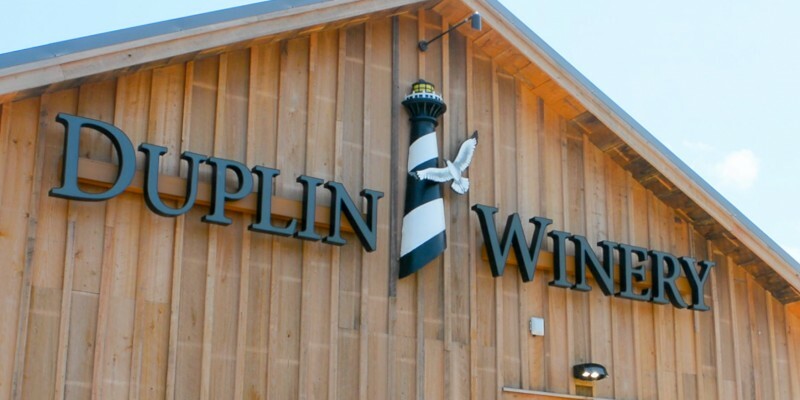 Take part in a wine tour at Duplin Winery. At Duplin Winery, you can sip on ten different types of wine with your beloved while you snack on homemade gourmet crackers and homemade dip. After you’ve polished off your samples, you order a full glass of your favorite wine and sit back and relax on the porch in a rocking chair or listen to live music. Another wonderful place to enjoy sipping on wine is at La Belle Amie Vineyard . This vineyard is part of a former tobacco plantation and has been owned by the Bellamy family since the 1800’s. On Valentine’s Day they will have live afternoon music or plan to be there on February 17 for the Valentine Bonfire Event. Treat your significant other to a little more than a heart-shaped box of chocolates this year with a mini-vacation to Myrtle Beach. With luxurious accommodations and fine dining, the Marina Inn is the perfect place to celebrate your special relationship. Book our Valentine’s Day Package today and treat your loved one to a memorable weekend in Myrtle Beach! Holiday Fun in Myrtle Beach!